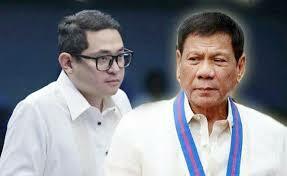 Libel Party and Opposition Senator Bam Aquino criticized President Rodrigo R. Duterte on his anti-corruption movement, who terminated ranking officials with alleged and on going cases in corruption and slammed for the same have been recycled or transferred to other government offices and saying it "double standard". “The President is sending mixed messages again, this time on the issue of corruption,” Aquino said. Former Customs Commissioner Nicanor Faeldon, who was investigated for alleged involvement in the smuggling of P6.4 billion worth of shabu (crystal meth), was appointed by President Duterte to the Office of Civil Defense. National Food Authority’s (NFA) Jason Aquino was also allegedly involved in corruption activities at the agency before he was appointed as administrator. Former Social Security System (SSS) Commissioner Pompee La Viña, another Duterte appointee involved in alleged profiteering, was recently assigned to the Department of Tourism as undersecretary.